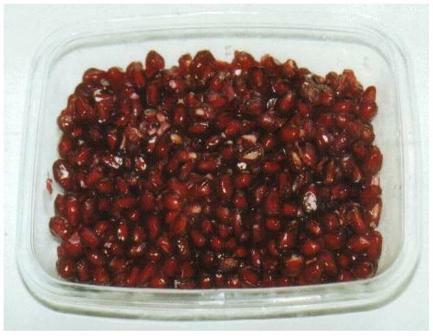 In spite of the pomegranate's many advantages and diversity, its potential has not been realized due to the inherent inconvenience and messy handling involved in extracting its seeds (arils). 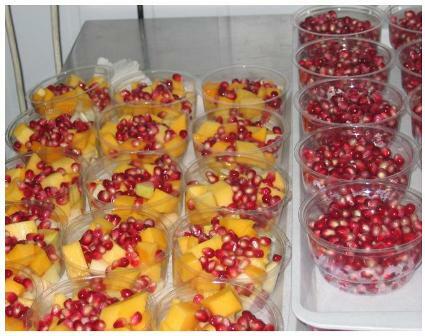 Until recently, whether one wanted to eat freshly picked fruit, produce high quality, tannin-free juice or derive various pharmaceutical products from the kernels it was a messy job. Now, a novel and patented technique has been developed in Israel, enabling the automatic extraction of the arils as a stage in a comprehensive industrial process. The process consists of conveying the fruit to the extraction machine directly from the orchard or from cold storage rooms. The fruit is washed and sorted, then subsequently moved through various stations where it is opened without being cut and the arils are exposed to the extraction mechanism. This separates the arils from extraneous materials and delivers them clean and undamaged to a packaging machine. A predetermined quantity is packed into a special MAP package, ready for shipment to the retail markets or to cold storage. The machine is capable of extracting the clean arils from over 1 MT of fruit per hour, with an extraction efficacy of 90-95% and incurred mechanical damage of 5-8%. Damaged arils are removed manually or by an additional (optional) automatic sorting machine. Currently, the shelf life of packed arils on cold shelves (4-6° C) is two weeks, but work continues in order to extend this.